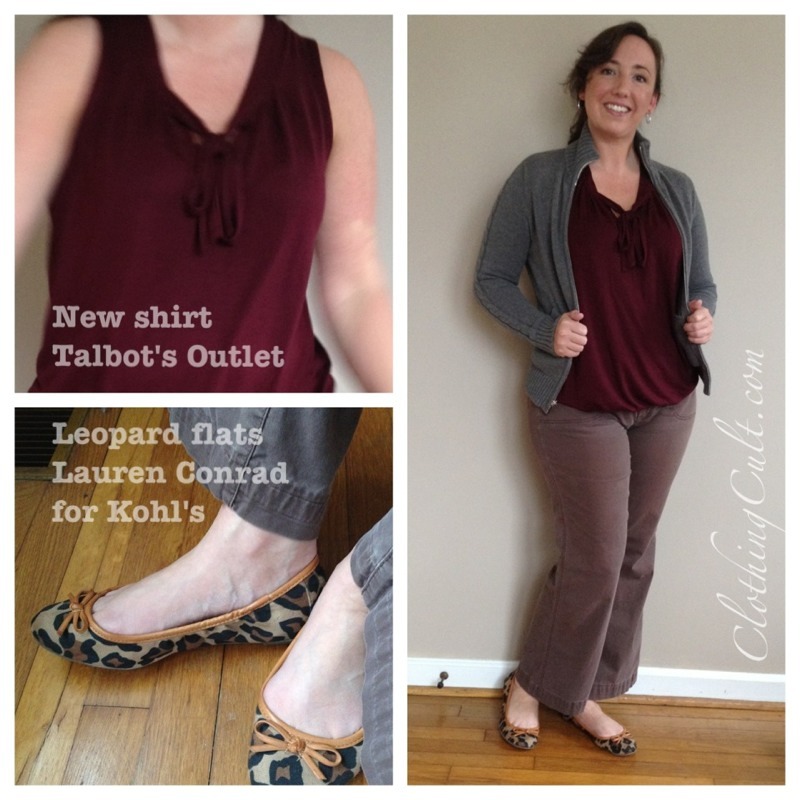 I’m a little behind on sharing my recent clothes purchases and outfits. Since I’ve got some more pictures with these shoes I’ll go ahead and start with them. 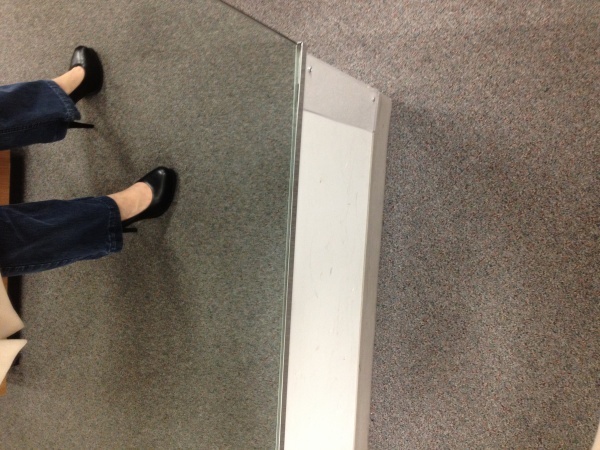 So at some point in a random shopping trip I had tried on the Vera Wang Platform heels in black (labeled “Dali” on the box) at Kohl’s and hadn’t bought them. 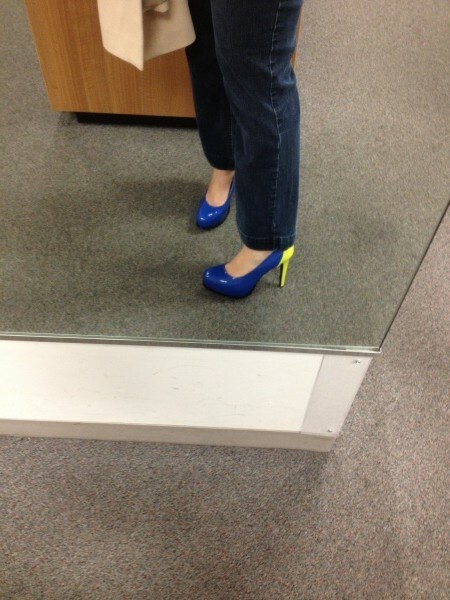 I also loved the blue and neon yellow pair but couldn’t rationalize them as a purchase. Both stuck in my mind so I decided to go back for at least the black pair. Aren’t they pretty! Ok they’re basic black but still, a step up from the last pair of black heels I bought. 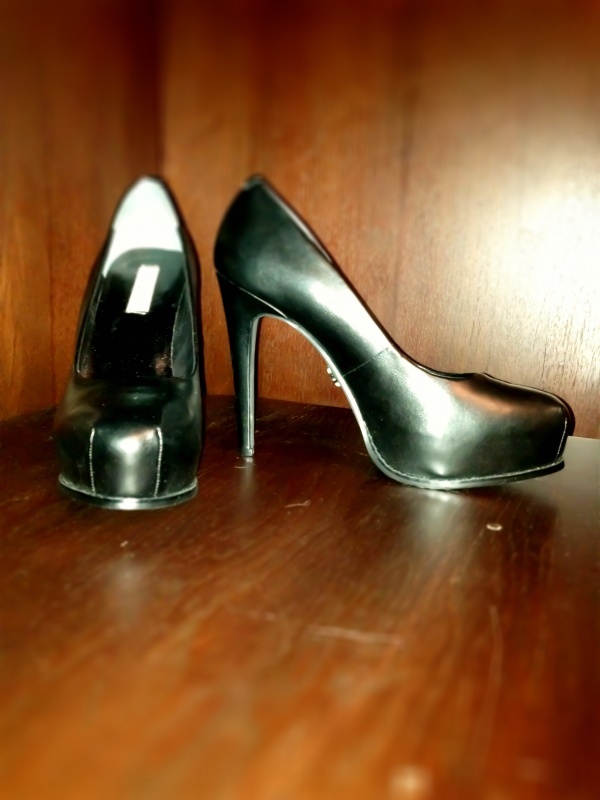 Wow again – it’s been 3 years since I bought a pair of black heels? 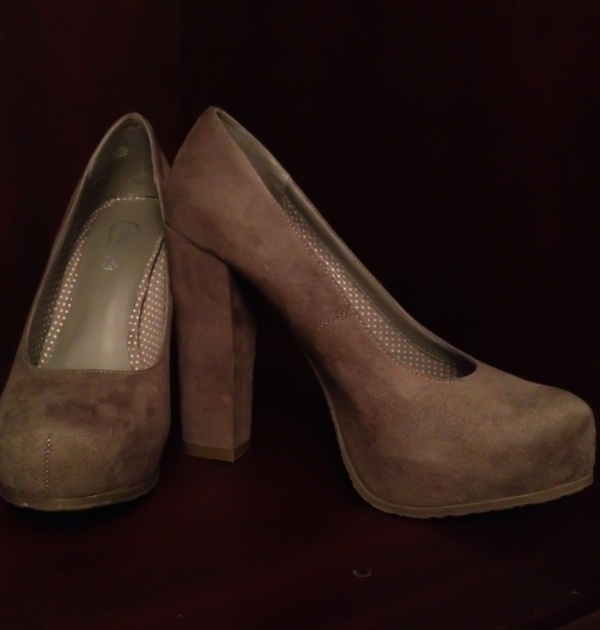 Then I spotted Candie’s Caposh in faux suede taupe with a chunky heel. They were only $19 (marked down from $59.99) with a “limited quantity” sticker. They look so lonely right? They say “take me with you Hilary…” Can’t you hear them? 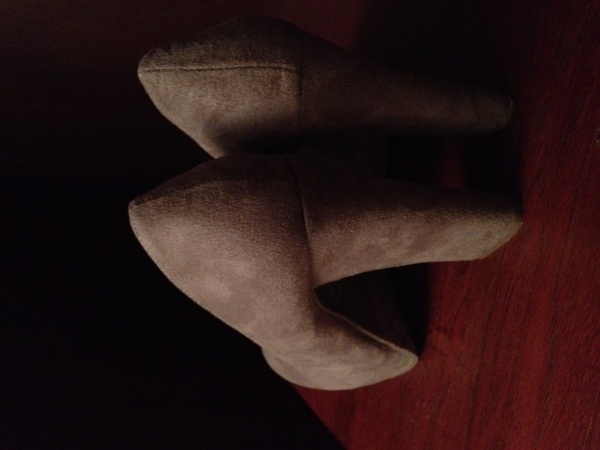 Anyway, fabulous chunky heel, lovely soft color. And though I’m not a huge fan of suede or faux suede I don’t think I would have liked these in regular leather. I think these will go well with a lot of outfits and the chunky heel and platform make them a bit easier to wear. I got to the cash register at Kohl’s to check out with my shoes and they do the usual check to make sure there’s nothing else in the box and that the shoes are a matching pair and match what the box says they are. The shoes were an 8.5 for the left and an 8 for the right! I hadn’t even noticed, I’m guessing because my left foot is a hint larger than my right anyway. The cashier says “I’ll have to check and see if we can find the other one or else we can’t sell you these.” Who, what!! NOOOOOO!!!!! Ok go check. Stay calm. Someone comes back with another set that are mismatched. But they match them up so it looks like we have two left in 8.5 and two right in 8’s. I say “they fit as they were and I’m willing to buy them mismatched anyway.” They say “we can’t sell them to you, you could check another store though.” To which I respond “but they’re ‘Limited Quantity’ and they fit, I don’t care that they’re mismatched!” and in my head I’m thinking that I didn’t see these shoes at the other Kohl’s which is a good 45 miles away from the one I’m at anyway. So one woman goes off to check some manual or maybe call someone and as I’m standing trying the shoes on at the register again just to prove that they fit I realize that they don’t have two left 8.5 and two right 8’s – they got confused when trying to match them and actually have a set of 8.5 and a set of 8’s! But I still have to wonder why they wouldn’t have sold me a mismatch pair if their match wasn’t anywhere in the store. I’m sure it’s just some policy taken one step too far, but still perplexing. Have you ever had a cashier refuse to sell you merchandise because of some store policy taken too far?